Not only have we lost the key it seems like we never had it. As a race we fail miserably with listening and that means we fail miserably with life, with love, communication, with health, politics, education and so on. We never have peace, not really, because we never learned to listen, though in our arrogance we think we listen when we do not, not on a deep level of being. to anything that might require a change. To listen is to change. We cannot change without listening. We need to change just to listen. We would rather have eternal war rather than listen. In America, for instance, the country is dividing in half with the potential for civil war because one side does not listen to the other. If one does not listen how can one even begin to understand what the other side is talking about or meaning. In climate science there are two sides with only one side listening to the other. Global warming proponents cannot stand to listen to those scientists who are speaking about global cooling yet those who point out that the sun is cycling down do understand and listen to the global warming story. Just happens that there is no truth to man-made global warming but do you think a person who believes in global warming wants to hear that? Vaccine proponents cannot stand to listen to the dangers of vaccines and how many children get hurt by them. And often husbands cannot stand to listen to their wives and visa versa. We don’t listen because we have never been taught. We just assume listening unless it is obvious that it is not happening. Some people are natural listeners meaning they listen more than they talk. We even have a hard time listening to our selves, to our own emotions, feelings, intuitions and vulnerabilities because our minds are so busy thinking that they leave little space to listen to the deeper internal spaces of being. Love listens so we should easily be able to understand why there is so little love in the world. Families are often the most dangerous places for women and children to be because, you guessed it, because the poverty of listening eventually breeds violence. Before we disagree we first need to listen otherwise we end up disagreeing violently. Religions teach us how not to listen because they teach the mind to disagree strongly with those of other religions, with those who think differently. How many people can think and see deep enough to understand that at heart our world is being destroyed from a lack of listening, which is a lack of caring, a lack of love. 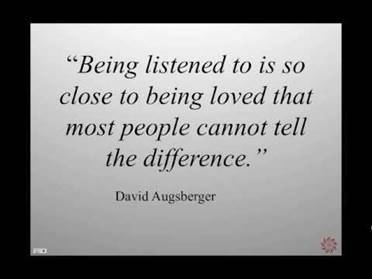 We needed to learn about love, about listening but so few people think that way. It is sad but true that we do not touch down on the consequence of not championing listening as a way of life. 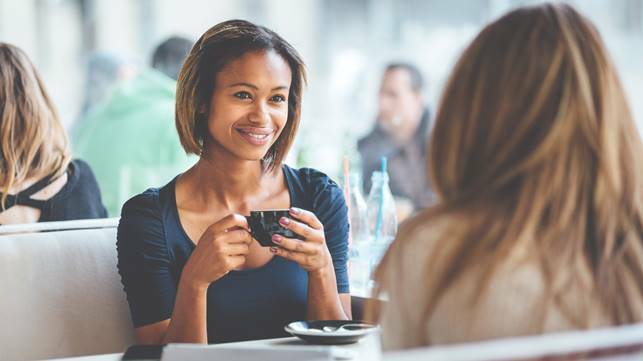 Listening is the ultimate social skill. It is much more pleasant to be with people who listen than people who talk too much.Quiet people tend to be good at listening.People who talk too much are usually terrible listeners. When a person says ‘yes but’ to something you say you know they were only listening to themselves and what they are planning to say next. We all love being listened to. We tend to love people who listen to us; we vote for people who listen to us; we buy the products and services of people who listen to us. The ability to listen is one of the most profound influencing skills available to us. Mirroring is the basic technique in a process called Creative Conflict. Not a very popular process because as a first step it demands that we learn to listen. Learning to listen is difficult, to say the least for most people because it confronts us with our egos, which by its very nature does not want to listen to anything about itself it does not want to know. I think with intuition. The basis of true thinking is intuition. Intuition tells a man his purpose in life. One never goes wrong following his feelings. for feelings and intuition are one. Life stripped of feelings is a life stripped of meaning. Saint-Exupéry wrote, “It is only with the heart that one can see rightly; what is essential is invisible to the eye.” A Cave Dive into the heart opens up a normally invisible world; it broadens our awareness and in general seems to know which way to go in life. What Saint-Exupéry was talking about is the heart’s capacity to feel, to intuit, for that is exactly what intuition is, the most refined of fine feelings. Our intuitive feelings are navigational beacons that play a crucial role in making those decisions upon which our destinies depend. Every feeling has its value and significance. They light up our paths of life. So where is humanity going when its leaders have no feelings to light up the path ahead? Politics is an insane attempt at human organization and it does not matter which philosophy, which concept or idea politicians follow.